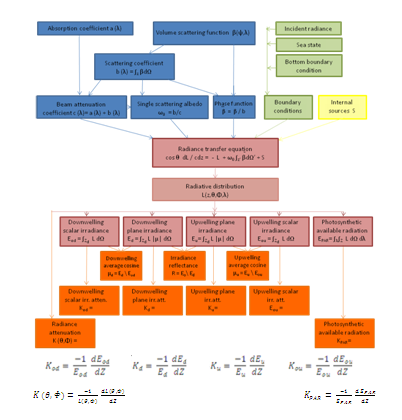 It can be run with modeled input values to generate in – water light fields, which are then used as input in primary productivity models or mixed – layer dynamics. It can be run with the IOP’s of different water types to simulate in – water light fields for the purpose of selecting and designing instruments for use in various water types. It can be run with assumed IOP’s as input in order to obtain estimates of the signals that would be received by various types or configurations of remote sensors, when flown over different water bodies and under different environmental conditions. It can also be used to isolate and remove unwanted contributions to remotely sensed signatures. As spectrometers detect not only the water leaving radiance in which we are interested, but also the sky radiance reflected upward by the sea surface. 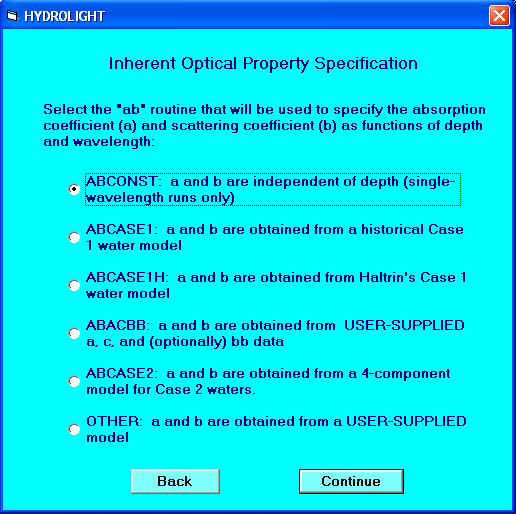 As Hydrolight separately computes all of these components, it can be used to correct the detected signature for surface reflection effects. It can be used in different configurations (IOP’s and boundary conditions) when analyzing experimental data in order to tighten up an existing parameterization. It can be used to simulate optical signatures for the purpose of evaluating proposed remote – sensing algorithms for their ability to simulate different environments or for examining the sensitivity of algorithms to simulated noise in the signature. It can be used to characterize the background environment in an image. When attempting to extract information about an object in the scene, all of the radiance of the natural environment may be considered noise, with the radiance from the object being the signal. The model can then be used to compute and remove the environmental contribution to the image. Hydrolight can be run with historical (climatological) or modeled input data to provide estimates about the marine optical environment during times when remotely sensed or in situ data are not available. Due to the difference in scales in the ocean ( Lh >>> Lv ), we can consider the ocean as consisting of optically independent patches of waters. We thus obtain patches of homogeneous water body whose optical properties vary only with depth. We can then independently apply a one dimensional radiative transfer model at the center of each patch in order to simulate the entire, horizontally inhomogeneous water body. In the analysis of imaging spectrometer data, one might even apply such a model to the water patch associated with the pixel in the image. The fundamental quality that describes the time - independent, 1D light field in the ocean is the spectral radiance L(z,θ,Φ,λ)in (W/m2.sr.nm), with z the depth, θ the zenithal, polar angle of the sun, Φ the azimuthal angle of the sun and λ the wavelength. An overview of the most important optic properties & their relationship to other variables is given by the figure below. This figure also learns us we will have to provide Hydrolight with incident radiance, sea state, bottom condition, absorption coefficient a, scattering coefficient b and phase function. The Hydrolight standard quad layout has a nominal angular resolution of Δθ = 10º and ΔΦ = 15º. For mathematical reasons, there is no quad centered on the equator. The Lahey Fortran 95 express compiler is a pre - requisite to Hydrolight. It has to be installed and registred before installing Hydrolight. Paste the "novoteste.for" - file and the "teste.for" - file in the batch - map of the maincode directory. 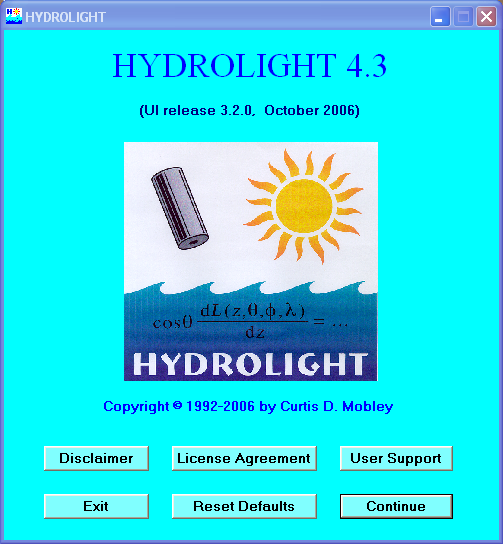 When first using Hydrolight you will need to read the disclaimer and accept the license agreement. Then you will have to define a root name in the run identification form. 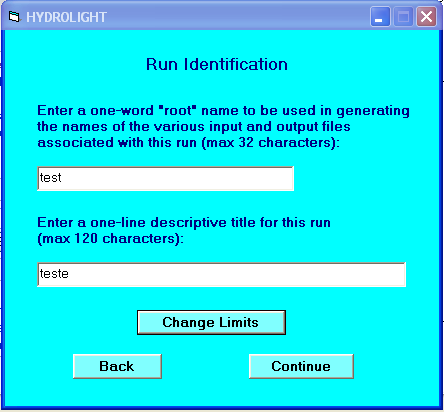 It will be used for all files generated by Hydrolight in this run. You can also enter a descriptive title in this form. 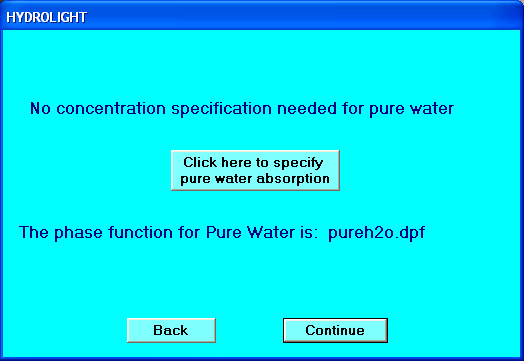 The parametrization of Hydrolight can be changed by selecting "Change limits"
Although recent papers have proven that this assumption is no longer essential, Hydrolight distinguishes case 1. waters in with a high concentration of chlorophylle (in comparison to other particles) and case 2. waters in which in organic substances are dominant. The models proposed here will use different calculation methods to calculate the absorption a and the light scattering b. Absorption can be defined as the process in which radient (light) energy is converted into chemical (e.g. photosynthesis) or thermal energy. Lights scattering is the proces wherein the light changes direction (elastic scattering ) and / or wavelength. In case only the wavelength is modified we speak of inelastic scattering (e.g. Raman - scattering , chlorophylle fluorescence). It is thus paramount to understand the behaviour of light in the studied water column before selecting a calculation method and a phase function. Furthermore, we will also have to specify a wavelength which will be used by bottom and sky models later on. In the next window we will have to define the Air - Water Surface Boundary Conditions. Whenever entering a new speed, we should press "update values" in order to confirm the newly entered value. The sky - model part will enable us to parametrize the atmospheric effects on solar radiation. The phase function consists either of a USER - SUPPLIED routine or is determined by Hydrolight by means of the bb/b - relationship. and the yellow matter is assumed to be non - scattering. In this model, the pure water absorption is taken from Pope and Fry (1997), and the pure water scattering is from Smith and Baker (1981). The user must specify the chlorophyll concentration profile Chl(z) and the scattering phase function for the particles. 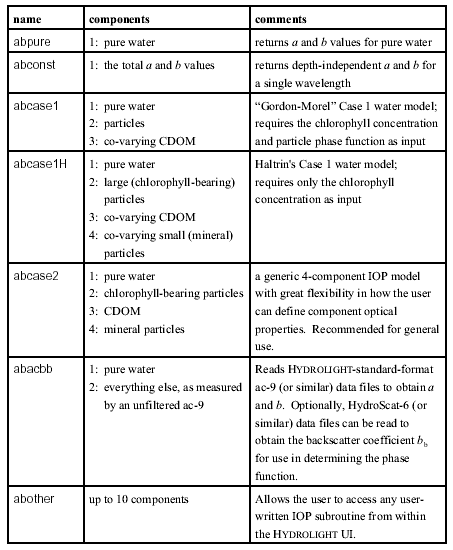 Note that this model reduces to the pure water case if Chl = 0, which is slightly different than the formulation of Morel and Maritorena (2000), which includes a small amount of yellow matter even in the absence of phytoplankton. With X the concentration, b, λ, m & n the model parameters. The Gordon - Morel (1993)for chlorophyll bearing particles is a special case of the power law model with X = Chl, b0 = 0.3, λ0 = 550nm, m = 1 & n = 0.62. Next we will have to define the band of wavelengths. 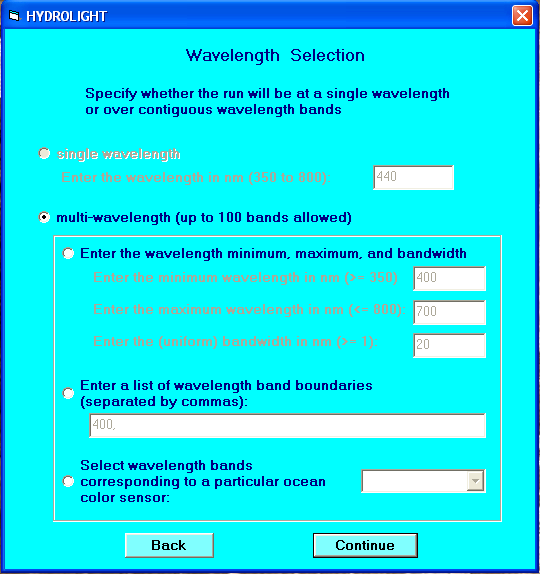 This can be done by either determining the minimum and the maximum wavelength and the wavelength band interval, by manually introducing wavelength band boundaries or by selecting wavelength bands to a particular ocean color sensor. 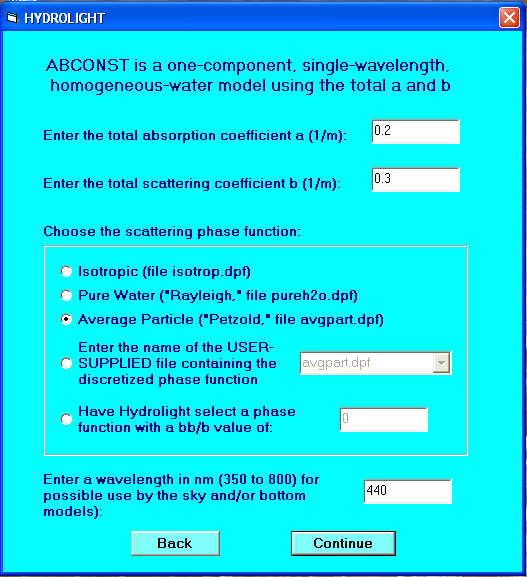 If you want to validate Hydrolight data with satellite data the last option is recommendable. 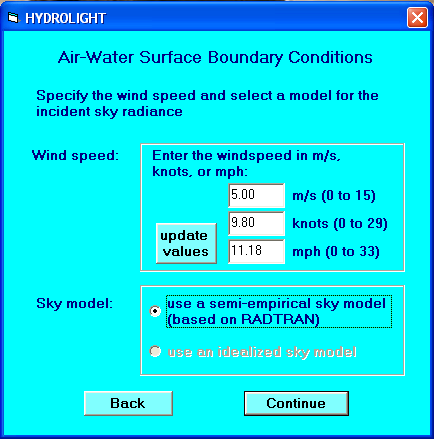 In order to execute a succesful run, Hydrolight must know the incident sky radiance on the sea surface. As this also depends on the state of the sea surface, we will have to provide Hydrolight with the wind speed. In order to calculate the surface radiation , we will have to define the sky model to be used. This can either be a semi - empirical sky model or an idealized sky model. 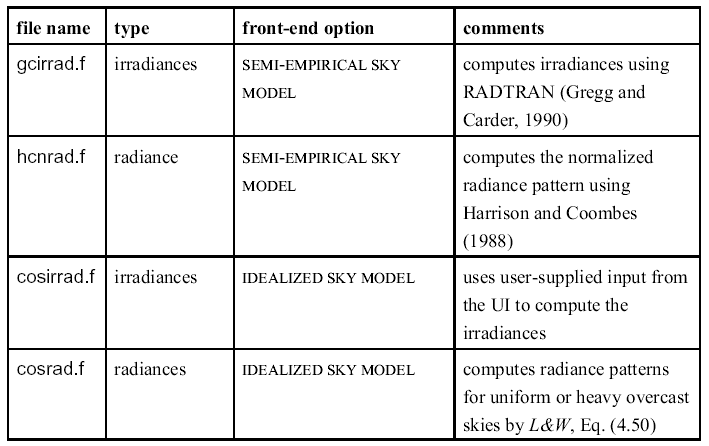 The use of the idealized sky model is advisable in the case of homogeneous or heavily overcasted skies while the semi - empirical model allows for more variation. In the ABCASE 1 - routine we will only be allowed to use the semi - empirical sky model. 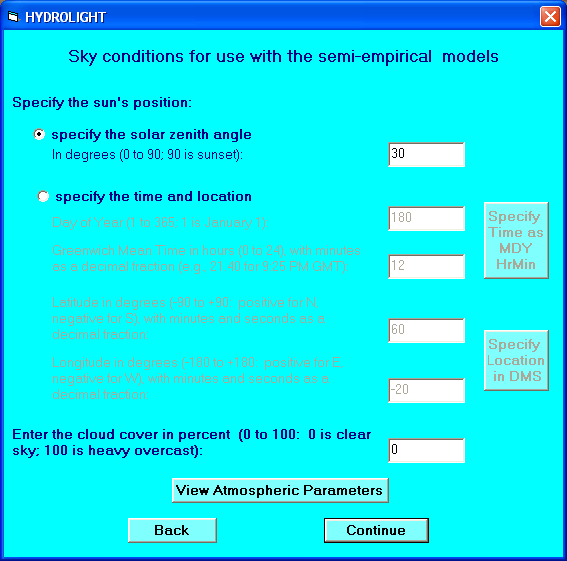 Then we will have to specify the sky conditions to be used with the semi - empirical sky model. The position of the sun is either given by the zenith angle or by specifying our time and location on earth. If we choose to do so, we can also modify the atmospheric parameters used by the model by selecting the button "view atmospheric parameters". The path of light through the water will also be influenced by its depth and bottom type. If the bottom is indfinitely deep, we won't have to define a bottom reflectance, as all the light will be absorbed by the water column. In case of a finitely deep water column,we can define a percentage of the incident radiation that will always be reflected (reflection is thus independent of wavelength) or a reflectance dependent on the wavelengt supplied by a USER SUPPLIED FILE which is more realistic. This USER SUPPLIED FILE is mostly supplied bu the Hydrolight library which has a variety of files to describe different bottom types (corals, algae, seagrass). 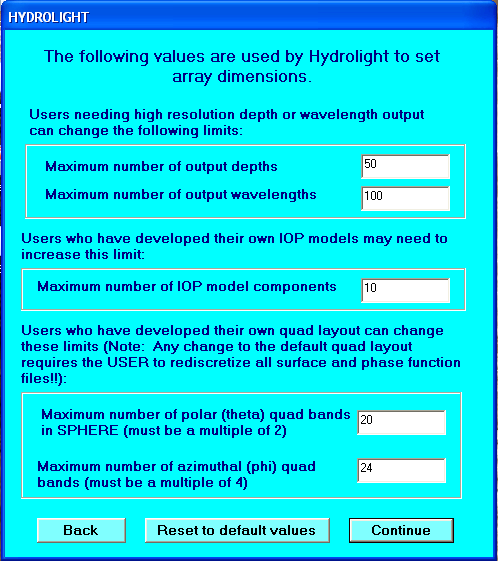 Finally, Hydrolight will also aks us to provide output depths. We can define up to 50 different output depths. 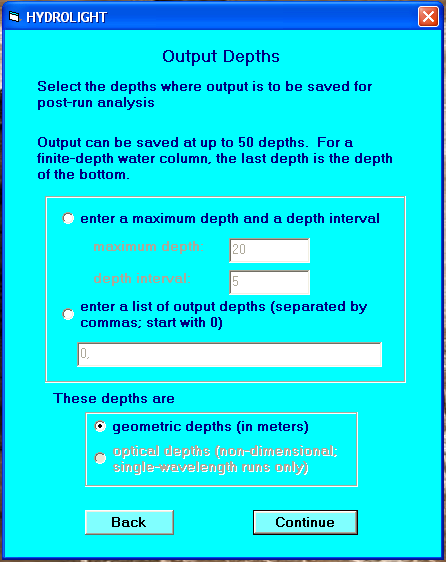 These output depths can either be geometric or optical (though for comparison of data, geometric depths are the most advisable) and are defined by entering a maximum depth and a depth interval or they are manually defined. The user will thus only need to supply Hydrolight with the chlorophylle profile in this configuration. The Haltrin ABCASE 1H - model is quite new to the scientific society, as a consequence experience is little and it is important to note that its' calculated IOP's can be considerably different from the calculated IOP's of the ABCASE 1 model. The ABCASE 2 model is a generic four component model that includes pure water, Chlorophylle - bearing particles, CDOM and mineral particles. The routine is designed to allow for a great user customization of the input. This flexibility rendering it suitable for many case 2 - waters. The routine also provides us with an alternative for modeling case 1 waters (e.g. by specifying the microbial and CDOM components as desired and setting the mineral conditions to zero). We can also compute light fields using absorption and scattering coefficients as measured by the WETLabs ac - 9 or HiStar instrument. In this case we will have to use the ABACBB model. This IOP - model comprises two components; pure water and everything else (particles and dissolved substances detected by ac - 9). 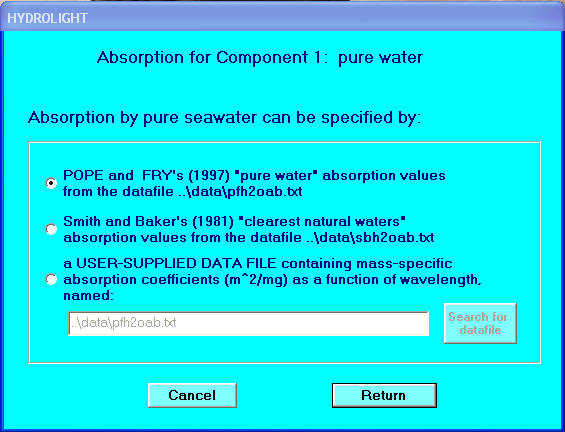 Hydrolight can read borth unfiltered and filtered ac - 9 files. The unfiltered ac - 9 file gives us the total absorption (particles + CDOM) whereas the filtered file only possesses the CDOM - absorption. Providing both files , thus allows us to seperate absorption into particulate and dissolved fractions, which gives important information about the ecosystem. Nonetheless, we should realize that light is only influenced by total absorption coefficient, total scattering coefficient and total phase function. If CDOM is assumed to be non - scattering, partioning the absorption into particulate and dissolved fractions does not change the total a, total b or phase function. Therefore it does not change the elastic scattering solution of radiative transfer equation. In abscence of fluorescence, the light field will thus be exactly the same. To quantify CDOM - fluorescence, we first need to know how the light was absorbed by the CDOM. 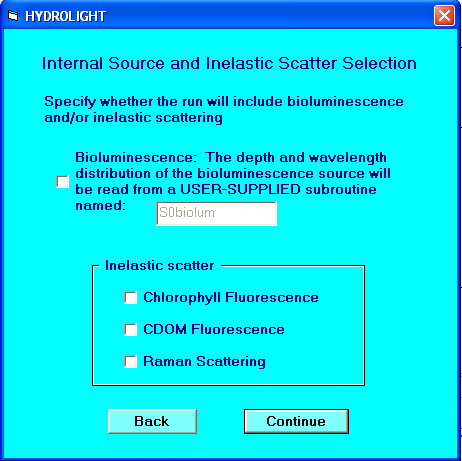 This can be obtained by selecting the option of including CDOM - fluorescence in the Hydrolight - run. If this is the case, the user can optionally define a data file which will come to contain a and c values from a filtered ac - 9. In most cases, CDOM - fluorescence is merely a small contribution to the total light field. Another important feature is the option of reading a file that contains backscatter coefficients bb(z,λ)as measured by instruments. If available, Hydrolight can use the backscatter fraction bb(z,λ)/b(z,λ) to generate a phase function having this backscatter fraction at each depth and wavelength. When ac - 9 and instrument data are used to dynamically determine the phase function according to backscatter fraction, a Fournier - Forand phase function is used. This closed - form, analytical phase function is based on Mie - theory and is parametrized by the real index of refraction of the particles and the slope of the Junge size distribution. By varying the particle index of refraction and size distribution, phase functions can be generated with very small (0.0001)to very large backscatter (0.4) fractions. When dynamically determining the phase function, Hydrolight automatically interpolates within its phase function collection ti generate a phase function at each depth with the needed amount of backscatter. 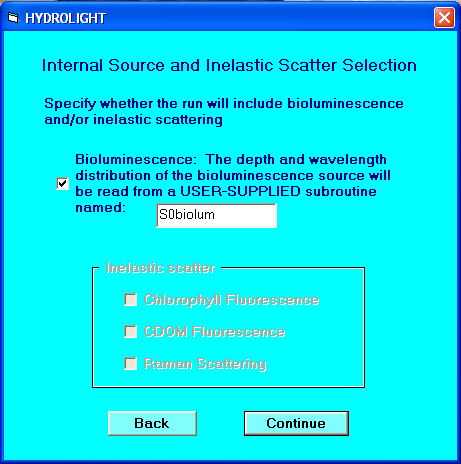 The only problem with this option is that when solving the radiative transfer equation, Hydrolight considers extremely small steps through the water column. In general, the backscatter fraction will change with every depth step, so that a new phase function should be generated for each depth step. As this would greatly add to runtime, the user interface will require the user to secify a backscatter - change parameter.This is the amount by which the backscatter fraction must change before a new phase function is generated, the default is 0.005 (5%). The Fournier - Forand phase functions are named by their backscatter fraction. For example the phase function on FFbb0001.dpf has a bb/b of 0.0001, whereas FFbb018.dpf has a bb/b of 0.018. Hydrolight always assumes your instrument data are flawless. 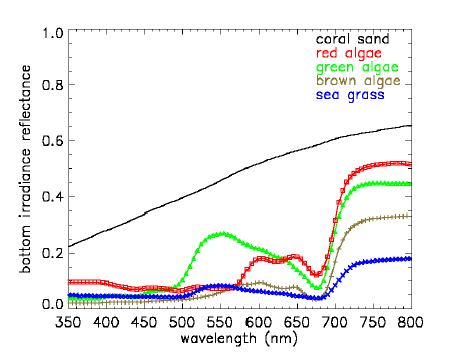 Even while measuring the IOP's directly, we will still need to provide Hydrolight with a chlorophylle - profile.